King Philippe of Belgium graced Kukkiwon, the World Taekwondo Headquarters, with his presence. King Philippe and officials of the Belgian government were welcomed by Acting Kukkiwon President Kim Youngtae and other executives and staffs of Kukkiwon on March 27 (Wed.) at 4:10 PM, and entered Kukkiwon with bright smiles on their faces. After signing his name in the guest book at the West Gate of Kukkiwon, the king headed to the Gymnasium, where a welcome ceremony had been prepared in honor of his visit. 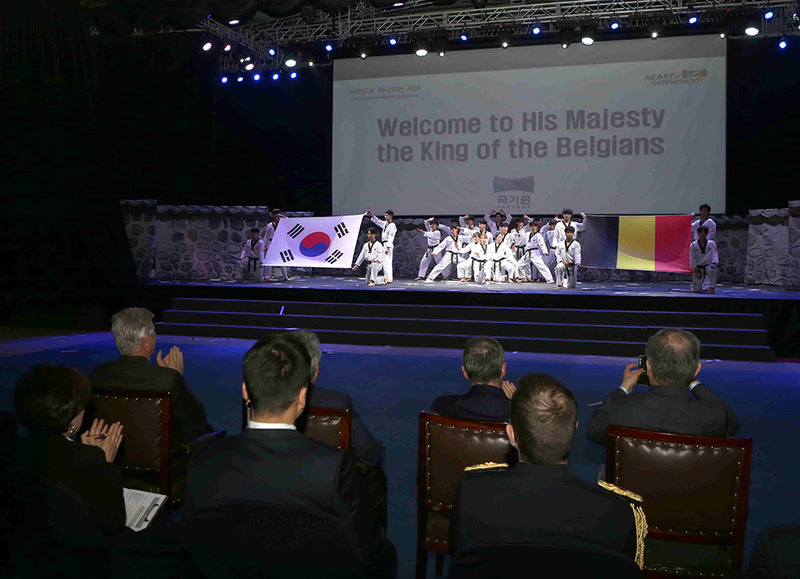 The welcome ceremony kicked off with a celebratory performance by the Kukkiwon Taekwondo Demonstration Team for the 20-odd figures in attendance, which included Kukkiwon executives, such as Acting President Kim Youngtae and Acting Secretary General Kim Il-seop, as well as King Philippe and other officials of the Belgian government. The king serenaded the demonstration team with applause as he watched their fifteen-minute-long performance, revealing his deep appreciation for Taekwondo. 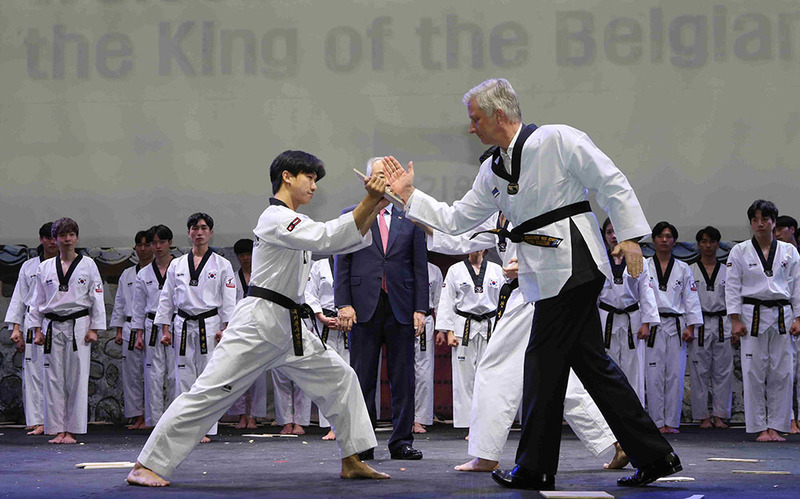 After the demonstration team concluded its performance, King Philippe, who had changed into a Taekwondo dobok (uniform), performed the Sonnal-gyeokpa (Knife Hand Breaking) to commemorate his visit to Kukkiwon. 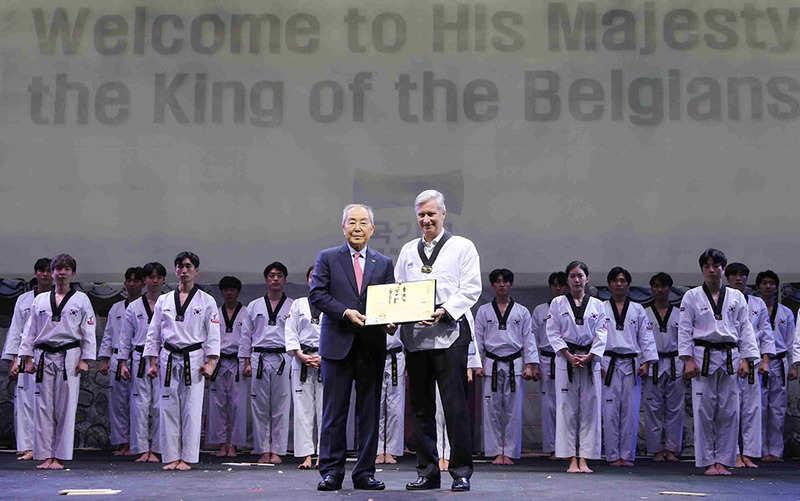 Following that, Acting Kukkiwon President Kim Youngtae bestowed the king with an Honorary 8th Dan Certificate on behalf of Kukkiwon, and asked for the king’s steadfast cooperation in promoting exchange between the two countries of Korea and Belgium through Taekwondo and expanding the base of Taekwondo. After taking a commemorative photo with the demonstration team, the king departed Kukkiwon to head to his next appointment, conveying his regrets about having to leave as he did. King Philippe of Belgium arrived in Korea through Seoul Air Base this past 25th, and will be departing on the 28th. During his stay of 4 days and 3 nights, the king held a summit and attended a state banquet with President Moon Jae-in, and visited Kukkiwon, and will attend the Korea-Belgium Business Forum and a seminar on smart cities. 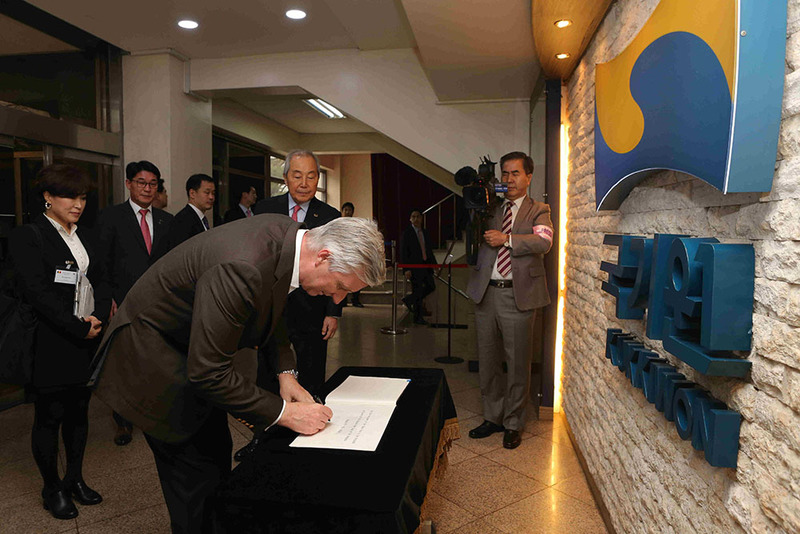 ▲ King Philippe of Belgium signs the guest book as he enters Kukkiwon. ▲ King Philippe of Belgium watches the congratulatory performance of the Kukkiwon Taekwondo Demonstration Team during the welcome ceremony held in honor of his visit. 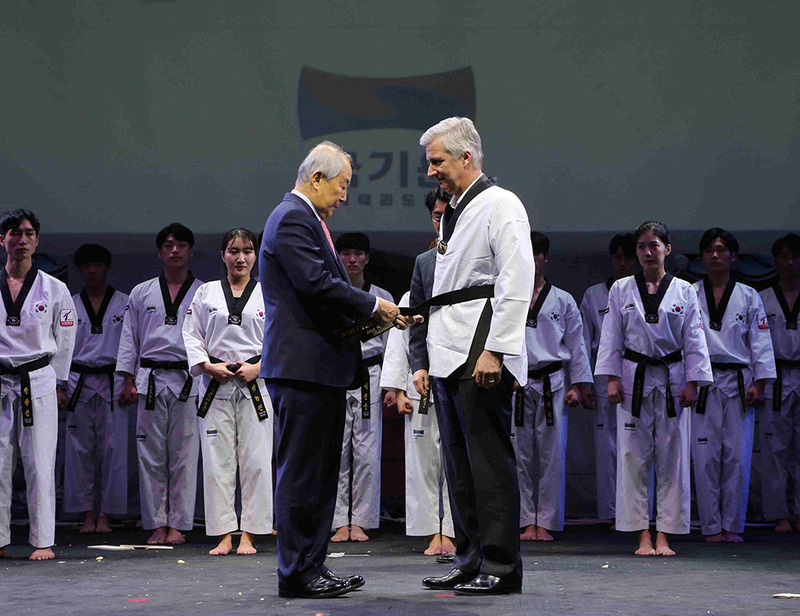 ▲ Acting Kukkiwon President Kim Youngtae (left) ties a black Taekwondo tti (belt) around King Philippe of Belgium. ▲ King Philippe of Belgium breaks pine boards to commemorate his visit to Kukkiwon. 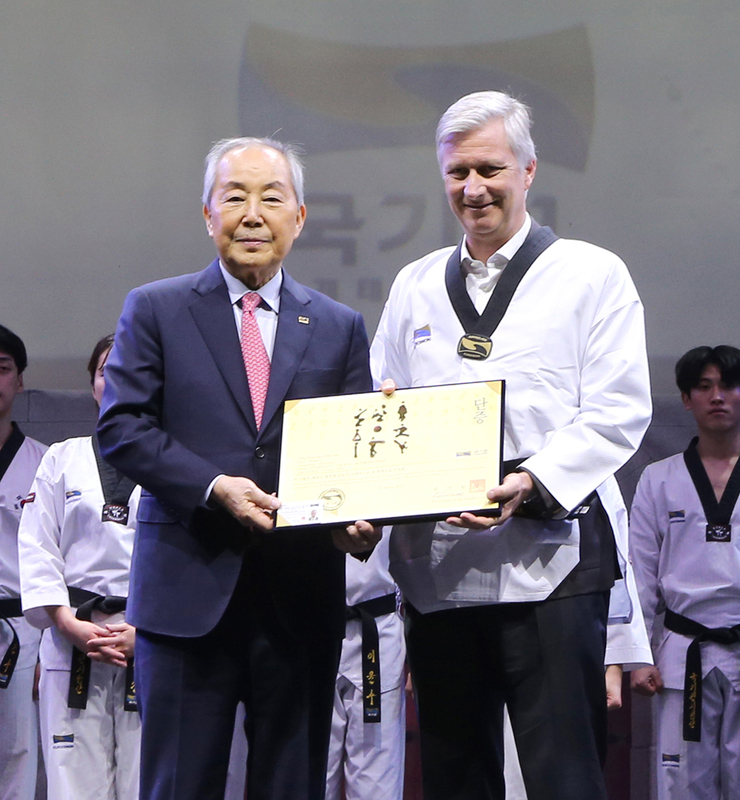 ▲ King Philippe of Belgium (right) receives an honorary dan certificate from Acting Kukkiwon President Kim Youngtae and takes commemorative pictures. 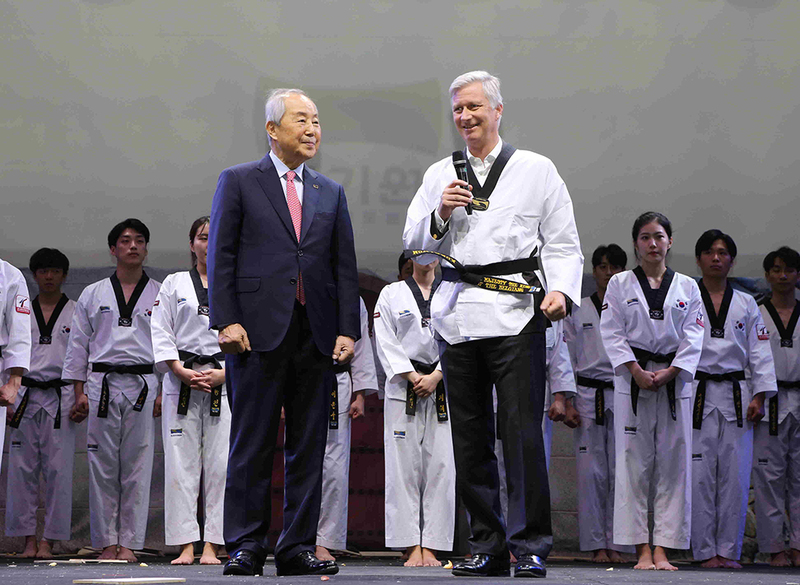 ▲ King Philippe of Belgium gives his thoughts on his visit to Kukkiwon. 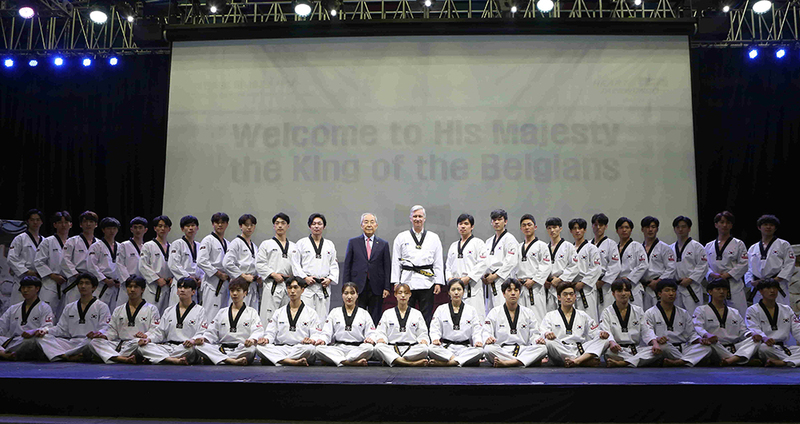 ▲ King Philippe of Belgium and Acting Kukkiwon President Kim Youngtae take commemorative pictures with the Kukkiwon Taekwondo Demonstration Team.